Delaware Bay is the country’s best known horseshoe crab mating ground, but I went to a beach this weekend on Fire Island that may give it a run for the money. Near the Pines is a quarter mile beach where friends and I counted 2,138 mating horseshoe crabs on Sunday night, two nights before the new moon. Tonight, the new moon (which means no moon) should be another peak in the mating cycle. 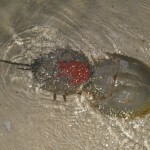 Several groups research horseshoe crabs on 1,000 miles of Long Island’s coast. The Cornell Cooperative Extension has been running a survey and will hold the Green Eggs and Sand horseshoe crab workshop this weekend ($100 at SUNY Stonybrook). The NY DEC protects the crabs (and has made Fire Island a protected zone). Dowling College also runs a Long Island horseshoe crab survey. John Tanacredi, chairman of the Department of Earth and Marine Sciences accepts volunteer reports, so send them in. 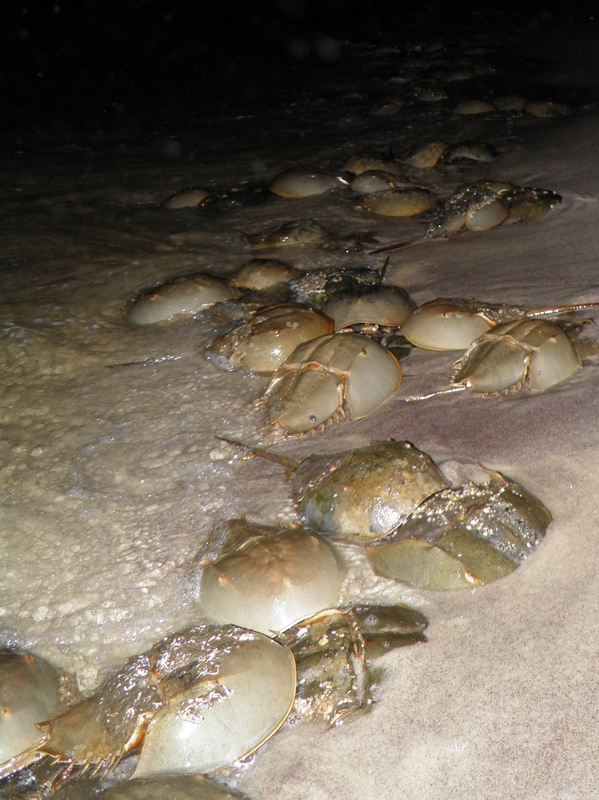 So these mass horseshoe crab sightings on Long Island may be something like a flash mob. They’re really impressive. 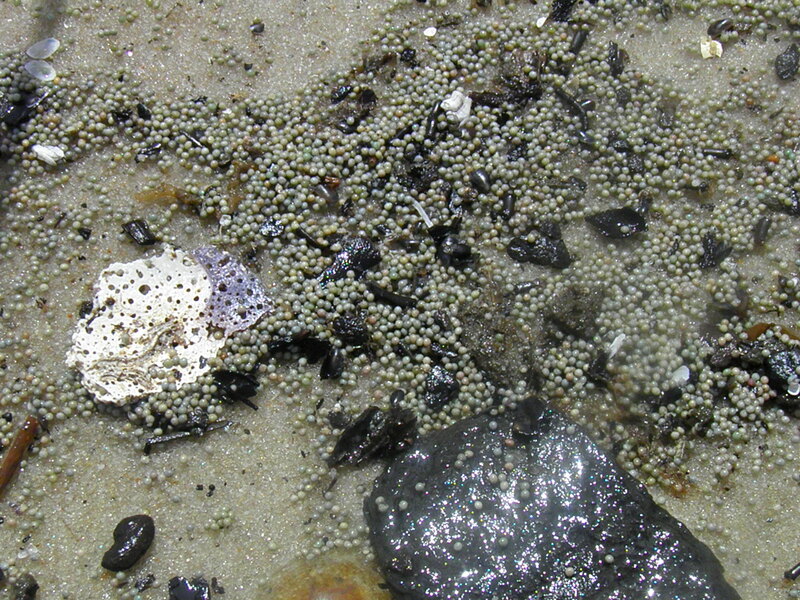 Previous surveys recorded just a few sites on Long Island with a few hundred horseshoe crabs. Last year’s giant surveys in NJ and DE found 1.5 million crabs, slightly less than the previous year and way fewer than in previous years. They count by seeing how many horseshoe crabs are in a one meter square and extrapolating from there. 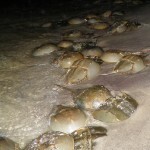 On the peak night–May 29, two nights after the full moon–Grandys beach in NJ had a 24 crabs in a square meter for a total of 28,500 on the beach. 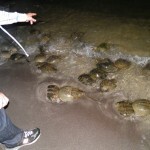 Big Stone beach in DE had an estimated 63,000 horseshoe crabs. 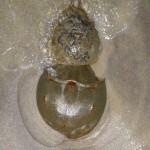 Traditionally, horseshoe crabs mate during the full and new moons at high tide. My friends on Fire Island noticed that they really showed up more just around dusk. 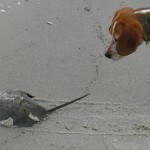 Just the day before we arrived they had caught horseshoe crab poachers near the tiny town of Water Island. A boat was lurking near the shore without lights, so my friends went out with lights to confront them. The boat sped off. In another incident, they yelled at a guy collecting the crabs on the beach. He offered “people are building million dollar homes around here!” as some kind of excuse. 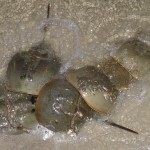 Fishermen use the crabs as bait for eel, whelk and conch–even though they could use artificial bait or at least bait bags. No one is exactly sure how many horseshoe crabs there are–which is which the late night beach counts are so popular–but the rough estimate is 2.5 – 4 million between NJ and VA, with the fisheries taking 2 million a year in 2004, according to HorseshoeCrab.org. The crabs have been around for millions of years, but they each need to be about 10 years old before they can reproduce. The surveys use much more precise counting methods than ours. 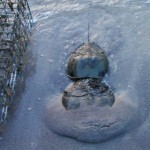 I went out on three nights at slightly different times (sunset and then two hours later at high tide). We didn’t count how many males or females. 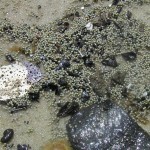 There are a lot more males; they pile on the females as they bury in the sand. In the morning we went out to flip the ones that had gotten stuck turned upside down. It’s an oddly satisfying pasttime, especially when you find a really big and old one and it is hopelessly stuck in driftwood. They ought to be out in huge numbers tonight. YES, THESE OBSERVATIONS ARE IMPRESSIVE. HOWEVFR, AT DELAWARE BAY THEY ARE AWESOME WITH A DOZEN OR MORE TEMPORARILY DISCRETE POPULATIONS AS LARGE/LARGER THAN THAT OF FIRE ISLAND SPAWNING ON THE SAME TIDE. 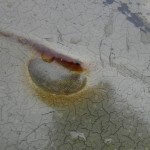 IT IS ACTUALLY POSSIBLE THAT THE TOTAL NUMBER OF SPAWNERS AT DELAWARE BAY IS AS GREAT AS ALL THE SPAWNERS ON SITES ASSOCIATED WITH LONG ISLAND.